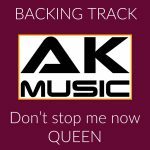 Struggling to find the right backing track? I create a high quality backing track of your favorite song in the desired tempo and key! Prices start just at € 59,00 (excl. VAT) for acoustic guitar, bass and drums.